Velgon Kota offers coffee made in a pot, other warm and cold drinks. Homemade doughnuts, savoury and sweet pancakes and other pastries. Sandwiches with different fillings and other savoury snacks. Most of the delicacies are made in Velhon Kota but we also buy some from the local bakery. We also have lactose-free and gluten-free options. The wild berries and herbs are collected from the local nature, they get their aromas from the midnight sun. We collect the berries and herbs ourselves or we buy directly from the pickers. 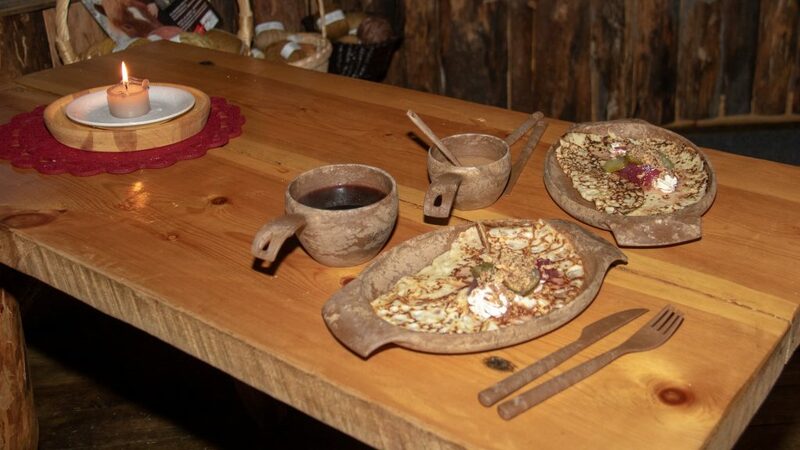 Our tableware is environmental friendly; Kupilka are designed in North-Carelia in Liperi and they are made in Kontiolahti. https://kupilka.fi/. By KipakkaKettu: yarns dyed with plants and mushrooms, bilberry powder, bilberry snack. We aim to recycle all the waste so we hope our clients to help us with this. We provide recycling boxes so when you bring your used dishes please recycle correctly. We have our own compost bin, any flammable products are burnt and finally as plastic, metal and glass are taken to recycling points. We can also arrange private events outside the regular opening hours. For more information contact us by phone +358 (0) 40 7470614 or by email info@velhonkota.fi.